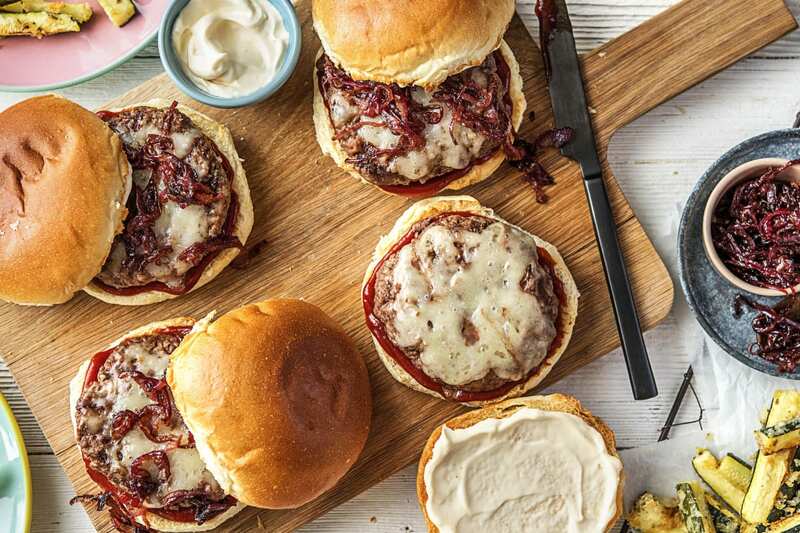 There are a lot of burger recipes out there, we know. 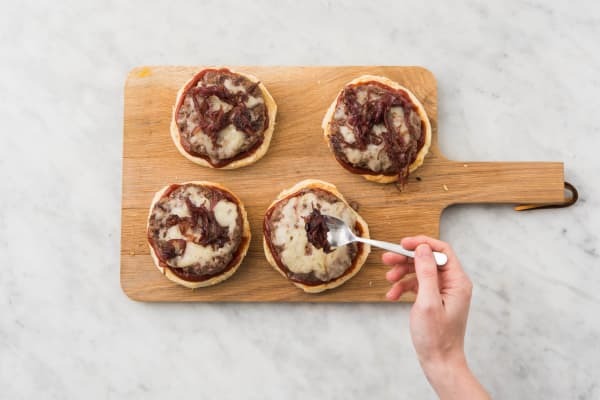 But we like to think that this is the burger that tops all burgers, thanks to oozy, melty Monterey Jack cheese and jammy balsamic onions. Oh, and we should mention that this patty comes with breaded zucchini on the side, so you can get your fix of crispy, crunchy finger foods and a dose of veg all in one. Wash and dry all produce. Adjust oven rack to upper position and preheat oven to 450 degrees. 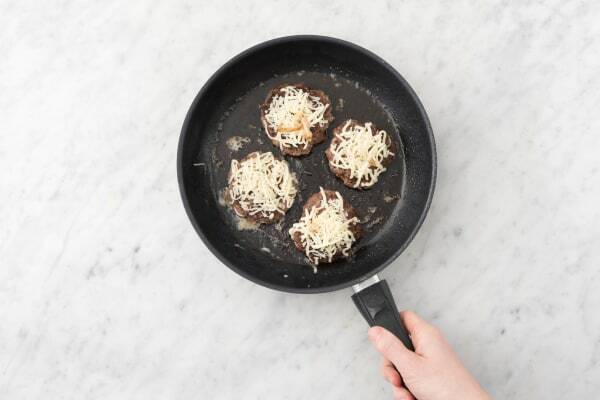 Mince or grate garlic until you have ½ tsp (you’ll have a clove left over). Halve, peel, and thinly slice onion. 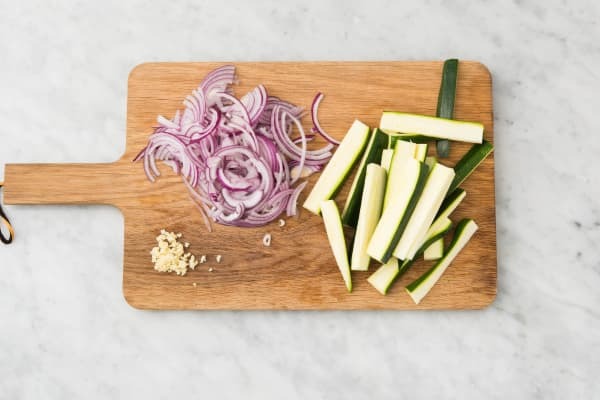 Cut zucchini into 3-inchlong sections, then halve each piece lengthwise. Cut halves into thin wedges. 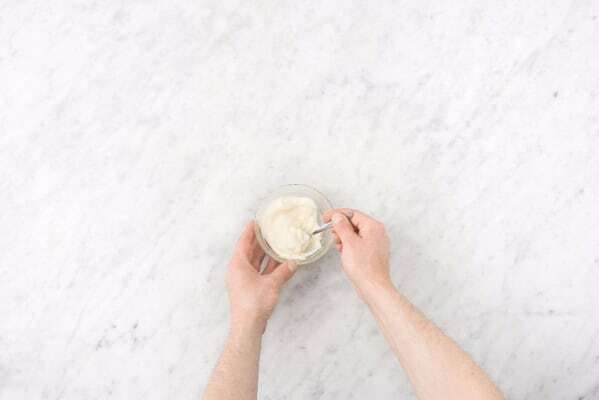 In a small bowl, mix together 3 TBSP mayonnaise (we sent more) and as much of the garlic as you like (start with a pinch and go up from there). Season with salt and pepper. Heat a large drizzle of oil in a large pan over medium heat. Add onion and cook, tossing occasionally, until browned, 8-10 minutes. Stir in vinegar and 2 tsp sugar. 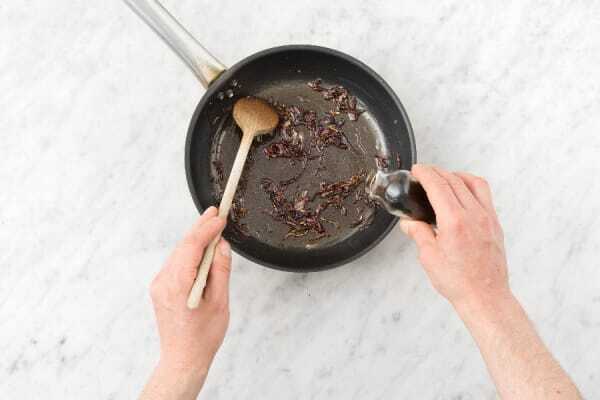 Continue cooking until syrupy, 1-2 minutes more. Season with salt and pepper. Remove from pan and set aside in another small bowl. Wash out pan. While onion cooks, toss together zucchini and 1 TBSP aioli in a medium bowl until wedges are evenly coated. 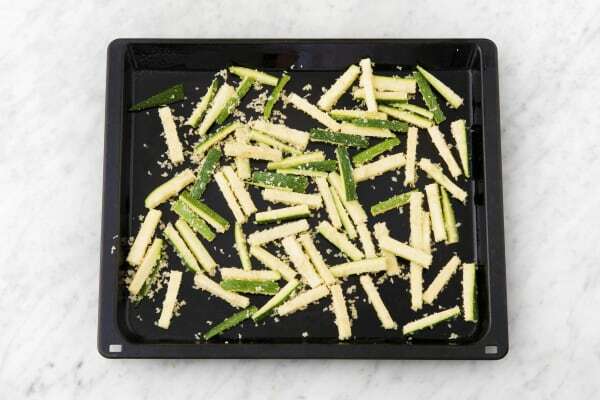 Add panko, oregano, and a large pinch of salt and pepper and toss so that crumbs stick to zucchini. Spread on a lightly oiled baking sheet. Bake in oven until panko is golden brown, about 15 minutes, tossing halfway through. TIP: It’s OK if not all the breadcrumbs stick. Heat a large drizzle of oil in pan used for onion over medium-high heat. Shape beef into four patties (make them slightly wider than the buns). Season with salt and pepper. Add to pan and cook until beef almost reaches desired doneness, 3-5 minutes per side. Sprinkle patties evenly with cheese. Cover pan and continue cooking until cheese melts, about 1 minute. While patties cook, split buns in half and place on another baking sheet. Toast in oven until golden, about 3 minutes. Spread ketchup and remaining aioli onto buns. Fill each with a beef patty and as much onion jam as you like. Serve with zucchini on the side.